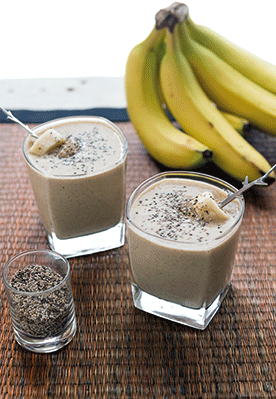 Blend all ingredients in a high-speed blender for 40 seconds until smooth and frothy. Bananas give you a big dose of potassium, almonds provide a B-vitamin boost, and hemp seeds are packed with 11g of protein per three tablespoons. Plus, the baobab powder, made from a nutrient-dense African fruit, supplies your body with a slew of beneficial minerals including calcium, copper, iron, magnesium, and zinc.